﻿ Allen Building Centre / Allen Lumber - Allen Building Centre has all your lumber for decks, fences, home framing, plus roofing shingles and insulation. Builders, contractors and consumers rely on Allen Building Centre for lumber, building materials, insulation, drywall, roofing shingles, hardware, expert advice and fair pricing. Recognized as Outstanding Retailer of the Year in 2006, and again for Outstanding Commercial Achievement in 2012, Allen Building Centre is your trusted building supply partner in Woodstock and Oxford County, Ontario, Canada. Our promise remains as strong today as it did 50 years ago...deliver quality products, service, expert advice and competitive pricing. 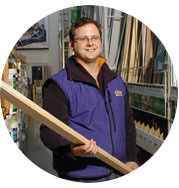 Our company deals with Allen Lumber everyday on all kinds of projects. The staff are more than friendly and very helpful. I would have to say that they (Allen Building Centre) have the best customer service I have ever seen not only from a lumber yard buy any business. Jamie and his staff are always there to help in anyway. I do, and will continue to recommend them to other tradesmen, friends and family. Just a quick note to thank you for donating the paint and stain. Large donations like that mean so much and go a long way in supporting the next house build coming up in Woodstock. Very much appreciated. Thanks again!